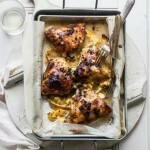 “This sweet-skinned chicken dish from Martyna Angell’s cookbook – The Wholesome Cook Book, has sweet pineapple and tangy lemon juice in the marinade, you’ll be licking the plate for more!” – from the I Quit Sugar team. 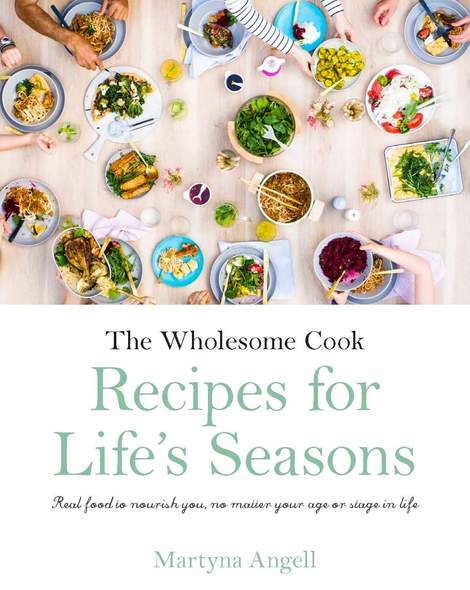 Yes, The Wholesome Cook book is not all about desserts. There’s a huge section on additive-free basics, guides to eating the best food for your body and avoiding those nasty processed foods you know you shouldn’t have anyway. The focus in the breakfasts, soups, salads, mains and even the dessert sections is on eating real food – even The New York Times agrees there’s a seismic shift in the way people eat and that’s SO good to see. 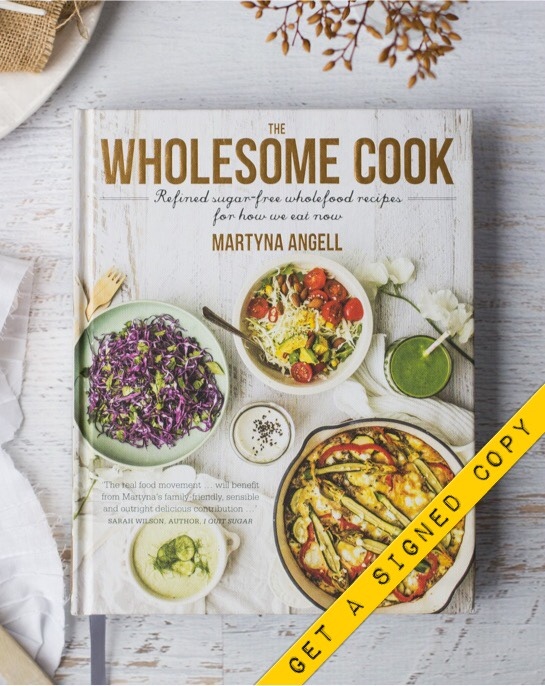 Sarah Wilson of the I Quit Sugar blog and author of another best-selling cookbook, Simplicious, said it herself: “the real food movement… will benefit from Martyna’s family-friendly, sensible and outright delicious contribution”. Thanks S! 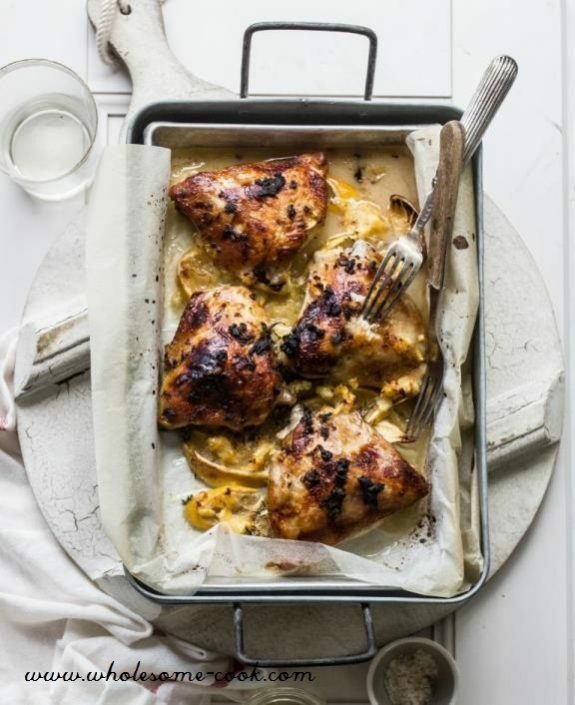 This scrummy Hawaiian-inspired Lemon Pineapple and Herb Roasted Chook Legs recipe (page 232) is no different – made with real ingredients, no added sugar or gluten and no nasties added. It’s paleo without trying, too. Crispy skin on a chicken is one of the best comfort foods in the world. However roasting a whole chicken to perfection can be a challenge, often resulting in overcooked thighs, burnt wings and limp skin. Since thighs are the same size, they will cook in a more uniform way and remain wonderfully succulent while the skin crisps up. And kids love it! This scrummy Hawaiian-inspired Lemon Pineapple and Herb Roasted Chicken Leg recipe (from The Wholesome Cook book, page 232) is no different - made with real ingredients, no added sugar or gluten and no nasties added. It's paleo without trying, too. Pat dry chicken with paper towels and cut in half to make 4 pieces. In a large ceramic bowl, combine lemon juice, oil and pineapple. Add chicken, toss to coat and marinate, covered, in the fridge for 1–2 hours. Preheat oven to 180°C (160°C fan-forced, 350°F, gas mark 4). Line a large roasting tin with baking paper. Arrange lemon slices and thyme on the bottom. Place chicken, skin side up, on top and drizzle with marinade. Bake for 50 minutes. Turn the oven setting to grill and cook for a further 5–8 minutes to crisp up the skin. Serve chicken with a large helping of dressed mixed salad greens. This looks absolutely delicious. And congrats on your book! I’m eager to try this recipe because I have the feeling my boys will love this!! They are super picky. Thanks for sharing!! Thank you Emilie and hope your boys will love this one! This looks so amazing! Our family sometimes gets in a chicken rut; love finding new ways to prepare it; thank you! Thanks Heather! I know what you mean!